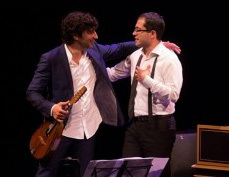 An Iranian harpsichordist and an Israeli mandolinist, Mahan Esfahani and Avi Avital, show the world what is important. The best minds are more interested in whether to create in a “major or a minor chord”, says one of them, than in playing upon historic hatreds. These invigorating young men are a charming delight. Such vitality is life-blood to energise a resilient new generation. Fortissimo!